Low voltage SRAM – the missing link ..
Google allows the management of millions of devices remotely ..
Arduino-compatible, DIY customisable keyboard ..
Red Pitaya takes T&M market by storm ..
First documented cryptocurrency malware attack on a SCADA network ..
Embedding an eFPGA: the starting point ..
Model-level debugging: a bridge between control engineering and software engineering ..
Tunable human-centric lighting places greater thermal demands on LEDs ..
e-cycling for the circular economy ..
AI chips could spill out of data centers, onto desks ..
How to choose a 3D vision system ..
More augmented/virtual reality at CES 2018 .. The top 20 news features on eeNews Europe in 2017 ..
Encryption perspectives in a world of quantum computers ..
World's smallest oscilloscope, multimeter and logger storms Kickstarter .. 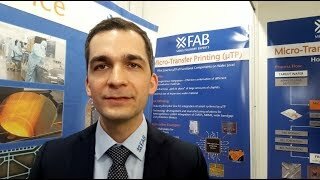 The emergence of PIN-on-Mobile ..
Tools and techniques for the implementation of variation-aware custom IC designs ..
Digging EDA's big data to speed up chip verification and tape-out ..
A Look at AI in Russia ..